Dulcis In Fundo is set in a historic building on the main road of Trastevere , Rome's most popular and lively area. This B&B offers air-conditioned rooms with free Wi-Fi and flat-screen TV. Fresh croissants are served daily for breakfast. 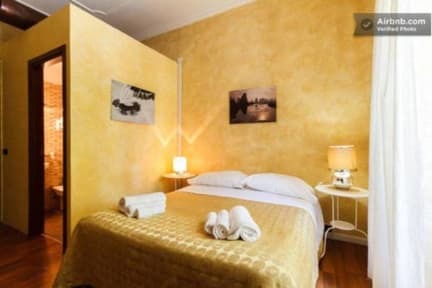 Dulcis in Fundo is located in the middle of Viale Trastevere, from here you can easily reach the city centre in a few minutes by walking or public transport. 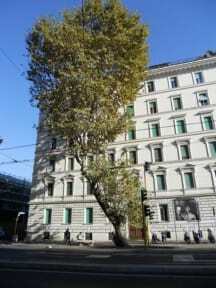 B&B Dulcis in Fundo is 50 m from the stop to get tram 8, which provides links to Largo di Torre Argentina square. Trastevere is a great choice for travellers interested in food, city walks and culture. Colosseo in only 15 minutes walking, Vatican city in 5 minutes by bus, Gianicolo is 10 minutes walking, Santa Maria in Trastevere is 5 minutes walking, Piazza Venezia is 10 minutes by tram. On Sunday the traditional outdoor market of Porta Portese takes place right outside the building. Rooms feature a modern décor, with parquet floors and colourful walls. Some rooms are en suite, and some have a private external bathroom. Check-in time must be previously communicated. Late check-in must be previously agreed. Reception: open from 10:00 to 18:00.